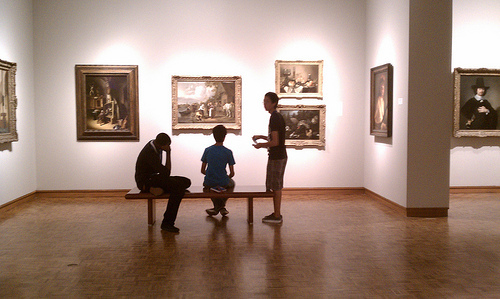 Satellite students study Northern Baroque works in the Collection galleries. Satellite students have been tagging, talking, and sketching in the past two weeks at the Museum. Traveling through Italy, the Netherlands, Spain, and France (virtually, of course), we’ve looked at figural paintings, portraits, and still lifes, and have even done some time-traveling to compare artwork hundreds of years apart. As I mentioned in my first post about Satellite, the blog idea just wasn’t working. We are now Flickr-based. There, we tag works of art with the big ideas from our discussions. But I still wanted to make sure our tagging and posting had a greater purpose. We added these photos to the Smarthistory Flickr pool, a website with fantastic resources and projects, one of which is to collect photos of works of art “in situ” and with people in them to show their scale. Satellite students' sketches of the Museum's Caillebotte. I had noticed during that activity that I could barely pull these visual arts students away from their sketching, so the next class, after a bit of discussion and word games (we compared Fragonard’s Rococo painting to the Neo-Decorative objects in European Design Since 1985), we got out our gallery stools and hunkered in for a good long sketch session in front of five Impressionist works in Gallery 11. You could have heard a pin drop, so intent were we on our work! 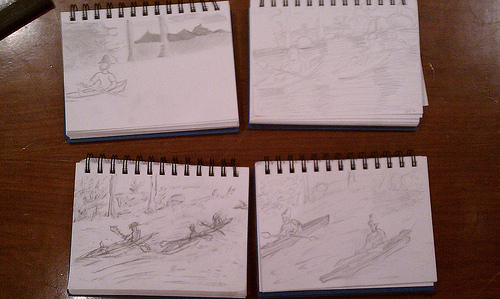 Find the (unfinished) results of our sketching time on our Flickr page. Afterwards, we talked about how difficult it was to translate the nuanced paintstrokes, thick application, and melting colors of Impressionist and Post-Impressionist paintings into a pencil sketch. I’m inspired by how much the students loved sketching in the galleries and plan to incorporate more of that into class time. Until my next post, keep checking our Flickr for more work by Satellite students! This entry was posted in Education and tagged Gallery Teaching, Impressionism, Northern Baroque, Pieter Claesz, Post-Impressionism, Satellite High School Program, Technology. Bookmark the permalink.